These are Pokémon and characters that were just a few of many different designs that Game Freak created. Only a few were added, and even those often went through redesigns before making it into the final product. Nothing is known about this creature other than its number, #124, the same as Jynx's. This number is also the index number of Caterpie. It also resembles a cat. Nothing is known about this creature other than its number, #211, the same as Qwilfish's. In the artwork featuring early versions of Red and Rhydon inside a cave, an unidentified creature can be seen. It appears to be hatching from an Egg. Nothing is known about Godzillante. It is shown to be breathing fire. As its name implies, it may have been based on Godzilla. 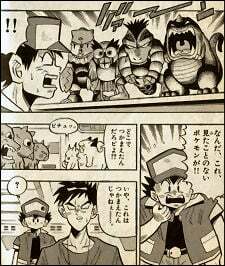 Godzillante shares a resemblance to a fake Pokémon toy shown in the Pokémon Pocket Monsters manga Volume 1 (p. 107). Its placeholder number is #23 as shown in the storyboard where it comes from. Nothing is known about Gorillaimo. Its hat could be a reference to the character Ninten from the Ape Inc. game, Mother. It also resembles the Nintendo character Donkey Kong. Gorillaimo could also be based on King Kong. Later generations have introduced many ape-based Pokémon. This creature's number is #124 (Coincidentally the same as Buhi) It knows a move called "Fire Breath" that requires 70 TP. It has short arms, a long tail, two horns on the back of its head, and draconic wings, much like Charizard. Not much is known about this creature. It has a roughly humanoid head, but with a round body shape. Its name, Kabiin, is similar to Kabigon, Snorlax's Japanese name. It also has similarly sleepy eyes and it somewhat resembles a simplified caricature of Kōji Nishino. The only known information about this creature is its name and image. In the playable alpha demo of Gold and Silver, its National Pokédex number was 212 and knew the moves Growl, Water Gun, and Tackle. Despite its Pokédex numbering, it was the Water-type starter in said demo. Since it resembles a seal, some fans believe it may have inspired Spheal's design, but they are no more similar than either of them is to Seel. Like Kurusu above, its name and image are all that is known about it. Its name is a combination of 炎 honō (flame) and 熊 kuma (bear). In the alpha, it was the Fire-type starter and knew the moves Ember, Scratch, and Leer. Nothing is known about this Pokémon, nor is there any artwork of it known to exist. Junichi Masuda and Ken Sugimori revealed in an interview with @Gamer magazine that there was a rejected Pokémon design based on the first cloned sheep, Dolly. They removed it after deeming it "too controversial" for Pokémon. Since Dolly was born almost eight months after the Japanese release of Pokémon Red and Green, it is likely that this Pokémon would have been intended for Generation II. Some fans believe that instead of being abandoned entirely, the rejected design was reworked into Mareep or Flaaffy. A Pokémon based upon a rabbit with a flower on its nose was designed by Hironobu Yoshida, but was scrapped due to it not making sense in its environment. It was revealed in an interview with Nintendo Life. Flygon has had the potential to have a Mega Evolution since XY, but Game Freak was unable to complete a design and so it was dropped from consideration. It was revealed in an interview conducted by the magazine Nintendo Dream. An English translation was provided by PokéBeach. Gorochu (Japanese: ゴロチュウ Gorochū) was originally intended to be Raichu's evolution. Pikachu's original illustrator, Atsuko Nishida, and Pokémon designer Ken Sugimori revealed the lost evolution in an interview with Japanese newspaper Yomiuri on May 2, 2018, and Siliconera translated the article into English on May 3. The design was to include fangs and a pair of horns. Sugimori cited game balance issues, which led to the design being omitted from the games. An unused Generation I Pokémon design, revealed in the 2018 educational manga "Satoshi Tajiri: The Man Who Created Pokémon". It was shown on a page discussing a poll in which the staff of the game would vote for their favorite Pokémon before including some of them in the final games. It appears to be based on a deer. Its index number is "56". An unused Generation I Pokémon design, revealed in the 2018 educational manga "Satoshi Tajiri: The Man Who Created Pokémon". It was shown on a page discussing a poll in which the staff of the game would vote for their favorite Pokémon before including some of them in the final games. It appears to be based on a crocodile with large eyes and what appears to be, long 'hair'. Its index number is "62". An unused Generation I Pokémon design, revealed in the 2018 educational manga "Satoshi Tajiri: The Man Who Created Pokémon". It was shown on a page discussing a poll in which the staff of the game would vote for their favorite Pokémon before including some of them in the final games. It appears to be based on a balloon and its name is a pun on the word balloon. It may have also caused the split between flying and bird type. Its index number is "81". Its cry is still in the final game left unused. An unused Generation I Pokémon design, revealed in the 2018 educational manga "Satoshi Tajiri: The Man Who Created Pokémon", inspired by cacti. It was shown on a page discussing a poll in which the staff of the game would vote for their favorite Pokémon before including some of them in the final games. Its index number is "67". Its cry is still in the final game left unused. An unused Generation I Pokémon design, revealed in the 2018 educational manga "Satoshi Tajiri: The Man Who Created Pokémon". It was shown on a page discussing a poll in which the staff of the game would vote for their favorite Pokémon before including some of them in the final games. It appears to be based on a shark, in particular those with a pointed head. Its index number is "68". An unused Generation I Pokémon design, revealed in the 2018 educational manga "Satoshi Tajiri: The Man Who Created Pokémon". It was again part of the contest, shown in the manga on a board. Not much is known about this Pokémon. It appears to be based on an elephant. Its index number is most likely "61" as it is behind Crocky. This unused Generation I Pokémon was revealed in a tweet featuring even higher-quality versions of the sprites revealed in the manga "Satoshi Tajiri: The Man Who Created Pokémon." It looks like a Tyrannosaurus Rex. Nothing else is known about this Pokémon. Interestingly, its index number is 1 while Rhydon's index number is 0. An early version of Gengar and a creature with traits of Nidorino, Gyarados, and Feraligatr. This early design shows Ivysaur, identified by its index number, with a blossomed flower on its back. An early version of Weedle. This was one of several Pokémon sprites shown on Game Freak's official Japanese website circa 1997. The evolution of Kokana. This was one of several Pokémon sprites shown on Game Freak's official Japanese website circa 1997. It was replaced by Kakuna, although they share few similarities. The evolution of Kasanagi. This was one of several Pokémon sprites shown on Game Freak's official Japanese website circa 1997, labelled "undecided". Like its pre-evolution, it was replaced by Beedrill, but it somewhat resembles Ledian and a cockroach. This early version of Spearow, identified by its index number, was revealed on a sprite sheet for Pokémon Red and Green. Its design is different, with traits similar to both Farfetch'd and its final version. An early design for Clefairy, identified by its index number, that was shown on a sprite sheet for Pokemon Red and Green. Its round body is similar to its final design, although there are many differences, such as its horns and extremely enlarged eyes. An early version of Poliwag. This was one of several Pokémon sprites shown on Game Freak's official Japanese website circa 1997. An early version of Poliwrath. This was one of several Pokémon sprites shown on Game Freak's official Japanese website circa 1997. Notably it is wearing a crown, similar to the King's Rock necessary to evolve Poliwhirl into Politoed. A very early design for Seel, revealed in the 2018 educational manga "Satoshi Tajiri: The Man Who Created Pokémon". It was again part of the Popularity Poll entry sheets shown in the manga on a board. Although it does not resemble its final design, its name in Japanese, Pauwau (パウワウ'), is identical. Not much is known about this Pokémon, except that its name roughly means "rock." It was shown being released from a Monster Capsule. It seems to have features of a Rhydon, shrunken down to fit into the ball. An early version of Dragonair. This was one of several Pokémon sprites shown on Game Freak's official Japanese website circa 1997. An early version of Marill. While they are recognizably similar, they are visually quite different. The pink/purple color is the main difference as well as the notably missing large ears. It also sports a thinner body, more resembling a rodent, but does not sport Marill's erratic tail pattern. An early version of Hoppip from 1997. Notably with a darker body, no arms or legs, and with a more sinister mouth and eyes. The final design, released a couple of years later in 1999, can be seen below. This early sprite of Girafarig from 1997 shows the original design featured two full-sized giraffe heads. It is unknown why the design was changed, but overall it remains mostly similar outside of some coloring differences. This design might be a reference to Girafarig's name being a palindrome. It also bears a resemblance to a pushmi-pullyu. The final design, released a couple of years later in 1999, can be seen below. This artwork resembles Raikou and Suicune. It was illustrated by Muneo Saitō, who was also the designer of the legendary beasts, including Entei. This early version of Torchic shows its lower body covered by an eggshell, with the fluff going all around its neck and wing-shaped ears. The other early design is nearly identical to the current Torchic, aside from the large floppy ears, and a flame-shaped marking on the back of its head, rather than the final design's flame-shaped feathers on top of its head. Sometimes referred to as Latiaziken or Latiken by fans, this early image from Pokémon Ruby and Sapphire depicts a creature with traits of both Latias and Blaziken. In appearance, it more closely resembles Blaziken, but some features are more similar to Latias, such as its size. Some features resemble neither Pokémon, such as the hands. Prototype back sprites of Shellos and Gastrodon show another form for each. These forms are possibly leftovers from when Shellos and Gastrodon were planned to be in Generation III. Shellos's sprite is pink, like its West Sea variation, and seems to combine the western variation's head with the eastern variation's body. Gastrodon's sprite is brown and looks like its Western variation, but with more rock-like protrusions on its body. Hydreigon's evolutionary line was originally meant to be army/military-styled Dragon designs. Ken Sugimori: "Deino, Zweilous, Hydreigon. At first, these incorporated an army tank motif, and the marks that look like a conveyor belt on the upper part of Zweilous's legs are the remnants of that. Initially, they didn't work as designs and were basically 'put to sleep', however, a three-stage powerful Dragon-type family was ordered and they were resurrected." In this early depiction of a battle, Blastoise is shown without its signature water cannons. Originally, this picture was captioned "Karabajio VS. Mimii", which are not the names of any known Pokémon. Karabajio may be a reference to the Italian painter Caravaggio, which in turn may reference how the Teenage Mutant Ninja Turtles are named after Italian artists. It also may include "carapace". The "arms" on Kakuna seen in its Red and Blue sprite are commonly mistaken to be a sprite error, as they are rarely shown in any other media. They have, so far, only been shown on its Red and Blue sprite and one of the Pocket Monsters Carddass Trading Cards. In most depictions since, Kakuna's arms are always tucked up against its belly, apparently unable to move. Pikachu's original illustrator, Atsuko Nishida, revealed the Pokémon's initial prototype resembled a daifuku (a round dessert) with ears in an interview with Japanese newspaper Yomiuri on May 2, 2018, and Siliconera translated the article into English on May 3. Its design basis changed to a squirrel to make it overly cuter, although the ear black tips are remnants of the initial concept. This early version of Lapras is recognizably similar, but visually quite different. Lapras's curly ears are not present, and the underbelly coloration ends under the lower jaw instead of including it. There are also no visible appendages or tail, but that may be due to the water. However, it bears a striking resemblance to its Generation I back sprite. Also in the sketch is an early design of Red. A demo released in 1998 showed that Chikorita's pre-release name was Happa (Japanese: ハッパ). Happa was previously mistakenly thought to be a prototype of Chikorita. An early sprite of Ampharos shows a lack of coloring. Its tail and head lack the signature red coloring to them and its belly is the same color as the rest of its fur instead of white. Ampharos is shown with a shorter neck and it only has two rings around its neck instead of three. Both early artwork of Bellossom and its Gold and Silver artwork show that it was originally to be a similar color to its other evolutionary relatives. This might have been changed to avoid another racial controversy, as the original Bellossom design appears similar to traditional Polynesian dress. It has very few differences compared to the final version. Of these differences, the early Tyranitar design is more heavy-set, has a tan, rather than indigo belly, arms more reminiscent of Nidoking, and dozens of short spikes upon its back rather than a few long ones. Concept art of Treecko shows numerous designs for the creature before the final one was decided. Many of these early sketches more closely resemble real geckos than the final product, which would later gain a more elongated head shape and a rounder nose. In its early design, its eyes were shaped differently, the positioning of the spikes on its body was slightly different, its overall shapes are much less sharp, its head details became much more elongated in the final version, and the weather trio's signature body patterns are not present. In Excadrill's first appearance in a promotional video, its body was violet and its markings were mirrored and a different shade of red. However, it was changed to its current appearance in the next video it appeared in. According to interviews with Ken Sugimori in Nintendo Dream, during development, Sawk and Throh both had horns to look more like oni. However, these were replaced with eyebrows so as not to clash with Tornadus and Thundurus, who were originally designed to be red and blue, like Throh and Sawk. An early version of Sawsbuck. This was shown at a convention featuring pictures and concept art from Pokemon Black and White. In an interview, it was said that Sawsbuck was created before the idea of seasons. Stunfisk was originally designed with an anglerfish in mind, but became more like a flounder. It was also a Water/Electric type, but was changed to Ground/Electric to balance out the type spread of Pokémon. Early Capsule Monsters artwork was shown in the book Satoshi Tajiri: A Man Who Created Pokémon, revealing an unnamed male character running a shop, or what would possibly become an early version of the Poké Mart. The character is almost bald, has long eyebrows and appears to be overweight. He is presented in a similar art style to the sumo enemies from Game Freak's debut title, Quinty (localized as Mendel Palace). Revamped and enlarged versions of Mendel Palace's sumo sprites also appear in Ruby, Sapphire, and Emerald as overworld sprites which are believed to be unused. This art of an unnamed female character (with Squirtle) was featured on the cover artwork for the official strategy guide for Red and Green, as published by Shogakukan. Sugimori had stated that he wanted to portray a trio of Trainers facing against each other, hence created the female character for the cover. When Red and Green were being developed for a remake, Sugimori took the unnamed female character into consideration as he was designing the female player character. A character named Green later appeared in Pokémon: Let's Go, Pikachu! and Let's Go, Eevee!, whose design appears to have taken inspiration from both the unnamed female character and the female player character of FireRed and LeafGreen. The unnamed female character also appeared several times in manga-styled instructions illustrated by Emiko Yoshino included in Pokémon papercraft sets (bottom). In the Pokémon Adventures manga, a similar artwork appeared at the end of Volume 3 (right). The design of the character Green seems to have drawn inspiration from this unknown female character. After the release of FireRed and LeafGreen, Green donned the same outfit as the female player character in the fifth chapter of the manga. This unnamed female Trainer art was revealed in a magazine prior to Generation II. This was a design imagined by Mr. Sugimori specifically for the magazine, created only to accompany the Games That Stand Out Collection feature. Visually, she has similarities to multiple Trainer classes. Her appearance is similar to a Beauty or Cool Trainer, but her outfit is similar to a Lass or Picnicker. There is an object on her shirt that looks like what could have been a Cascade Badge. Hiding in the background of the same magazine as the female Trainer above was a male Trainer that was never used. This was a design imagined by Mr. Sugimori specifically for the magazine, created only to accompany the Games That Stand Out Collection feature. He has hints of multiple classes, such as a Tamer, Psychic, Juggler, Burglar, PokéManiac, Gambler and a male Rocket Executive. There is an object on his bandanna that looks like what could have been a Gym Badge. This Badge has a red diamond on it. There is an unused Trainer seen riding Latiken in early concept art. It is difficult to tell whether she was intended to be a playable character, rival, or supporting character. This character has a strong resemblance to an unnamed character shown riding Latios in official artwork. This page was last edited on 26 March 2019, at 03:42.